One of my favorite features of the online version of The Guardian is a page called simply "Writers' Rooms." Once a week or so, a photo and brief description are provided of the writing den of a famous novelist, biographer, or literary critic. These used to be primarily living authors; recently some historical figures have been included. The spartan shed behind a modest house in Ayot St Lawrence, built on a platform that rotated with the sun, in which George Bernard Shaw churned out his voluminous correspondence. The Jacobean beamed study lined with Indian rugs in which Rudyard Kipling wrote, watched by a stern portrait of his wife, Carrie. 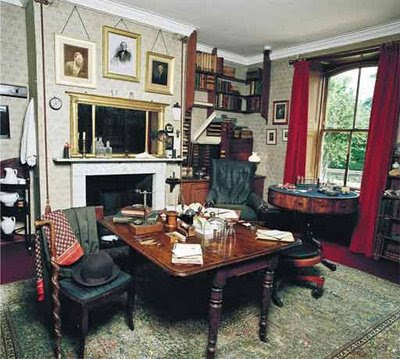 Charles Darwin's study at Down House, Kent, in which On the Origin of Species first saw the light of day (shown above). The "perfection of warmth, snugness, and comfort" that was the Haworth Parsonage parlour in which Charlotte Brontë wrote. Contemporary writers profiled who are of particular interest to Victorianists include the novelists A. S. Byatt (Possession), Sarah Waters (Tipping the Velvet and Fingersmith) and Colm Tóibín (The Master); the biographer Michael Holroyd (Bernard Shaw, vols. 1-4); and the historian Eric Hobsbawm (The Age of Revolution, The Age of Capital, and The Age of Empire). What a fantastic feature. Thanks for the links!